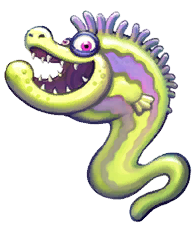 Fritz are aquatic enemies appearing in Donkey Kong Country: Tropical Freeze. They resemble yellow moray eels, hence their plump throats and elongated bodies. Fritz are patterned with violet stripes extending from their heads to their rear sides, dissolving towards their end. Their fins are cyan (yellow in the concept artwork) and placed behind their necks. They also feature an underbite, which frames a wide grin, and have a lazy eye. They sport a violet crest going along their scruff. Fritz are stationary creatures that regularly warp themselves from place to place through self-generated whirlpools. Between warps, they grab their tail into their mouths and start swirling rapidly, producing a load of electricity. The electricity is then discharged in the form of plasma balls, which are spread uniformly around the enemy, disappearing after reaching a certain distance. If the Kongs come into contact with one of these plasma balls, they lose one heart from their health meter. Fritz themselves will also drain one heart from the Kongs' health meter if they are touched. The enemies can be knocked out with a corkscrew move (while they are not charged with electricity) or with Cranky Kong's cane swipe. Fritz are recurring enemies throughout Sea Breeze Cove, debuting in Deep Keep. This page was last edited on November 10, 2018, at 11:24.